The Endeavor ED series from Vanguard is their flagship range and as you would expect from a top end binocular, they use a whole host of quality features and components including high reflective and phase correction coatings on the prism glass, fully multi-coated optical elements and the use of ED Glass. 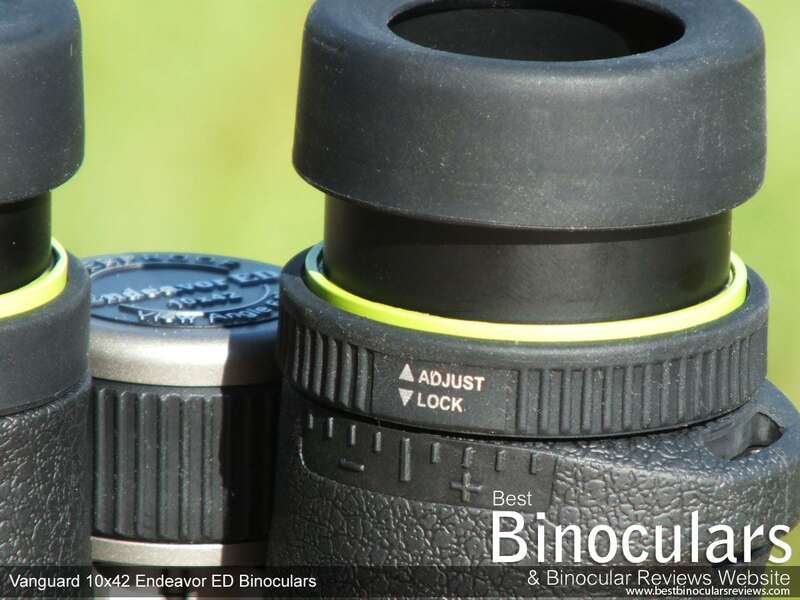 When I reviewed the 8.5x45 version of the Endeavor ED, I was very impressed and it even went on to win the award for the best value for money binocular that I reviewed that year. One of the standout features of that Endeavor ED was it's larger than "standard" 45mm objective lenses that really helped (along with quality optical components and coatings) to ensure that the binocular performed exceptionally well in low light conditions producing a really bright image. Vanguard now also produce 42mm versions of the Endeavor ED, an 8x42 and the 10x42 and I was really intrigued to see if these more "standard" configurations, but with the same components and coatings would still perform as well, especially in low light conditions. An open bridge makes a binocular far easier and more secure to hold onto, especially when you are carrying your optics with just one hand. When walking over difficult terrain or through thick undergrowth, I will often carry my binoculars one handed without the neckstrap. This is because unless you are using a harness, the neck strap and even the binocular can get caught up and snagged if you carry them around your neck. In these and other similar situations, you can also use your free hand to steady yourself or to clear a path. When climbing over rocky and very hilly terrain it can also be very annoying to have a binocular dangling from your neck and what is worse is they could easily smack against a rock or other obstacle as you climb over them. Simply holding them in your hand helps to overcome these problems and the open-bridge design ensures that your grip on the binocular is just that bit more secure because you can wrap your hand completely around one barrel. You have to be a little careful when comparing the weights of binoculars as this figure alone can sometimes be a little misleading: Some very light binoculars are sometimes only so light because they are made from lightweight, but much weaker and inferior materials (like plastic), thankfully this is not the case with these Vanguard Endeavor ED binoculars (take a look at the section on build quality below). 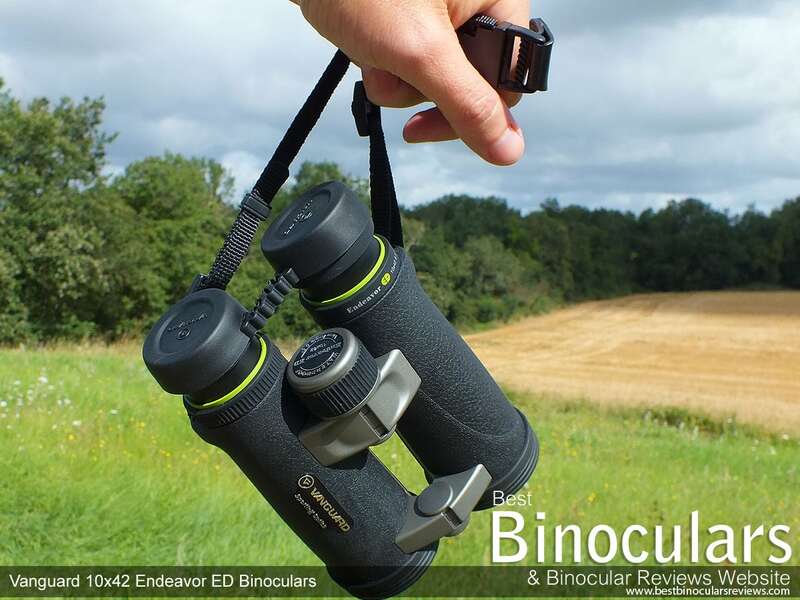 With their eyecups fully retracted, the Vanguard Endeavor ED 10x42 binoculars have a length of 15.4cm (6.0in), which is their advertised length. Completely twist out the eyecups and it extends their length to 16.1cm (6.3in). Folded (inter-pupillary adjustment set to it's minimum), their maximum width is 11cm (4.3in) - fully opened it is 13cm (5.1in) which is their advertised width. Overall, these dimensions are good for a full-sized binocular, I have seen more compact 8x42s, but have also seen much larger ones. In my rather "average" sized hands I felt that they were comfortable to hold as well as being well balanced and the central focussing wheel was easy to reach and turn without having to adjust from the standard grip when holding them up to your eyes. Vanguard don't state what the frame of the Endeavor ED 1042 is made from, which is a shame, but obviously without testing them to destruction they seem to be nice and robust and have an overall feeling of being very good quality. Apart from the two thin bridges, all of the exterior surface on the Endeavor ED binoculars are covered in a quite thick and fairly tactile rubber armoring which also has a fine texture on it, which help to ensure that you have a secure and non-slip surface to hold onto. This body armour also helps protect these Vanguards from day to day knocks and bumps. Apart from these obvious benefits the rubber covering also makes the body less reflective than if all the metal was left exposed, this is an important feature if you want to remain hidden when observing timid birds and other wildlife and is why it is a little bit of a shame that the bridges have not been finished is a duller color than the silver that is used. Finally this rubber armour helps to dampen down any sounds, if say your watch or ring strikes against the barrel, once again this is important if you want to remain undetected. Under each barrel on the underside of the body is a thumb indent which is placed in such a way as to encourage you to use the correct grip making the binoculars nicely balance in your hands. I also like that the objective lenses are set fairly deeply within the body (about 5mm) - which helps to protect them the lens covers have been removed. 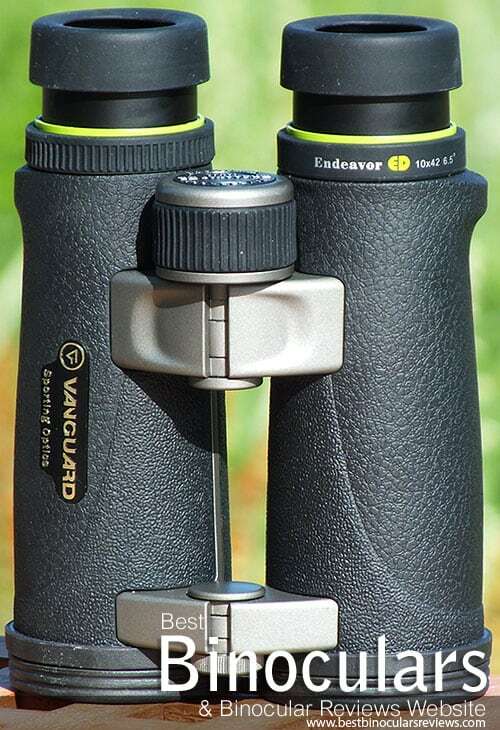 The body on these Vanguard 10x42 Endeavor ED binoculars are O-ring sealed to make them fully waterproof which obviously protects them from moisture, but also prevents dust and other tiny particles from getting inside them, which can lead to your view being spoilt. They have also been "Nitrogen-charged" meaning that the air inside the body has been replaced with dry nitrogen gas that prevents the internal optics from fogging up which can happen when you get rapid temperature changes. This moisture free environment also has the secondary benefit in that it also helps to protect the inner workings from any corrosion. Unlike cheaper optics that use a hard plastic, the eyepiece housing on these Vanguards look to be made from a metal, as are the twist-up eyecups, which have then been covered in a reasonably thick and soft rubber coating. The ocular lens has a diameter of 22mm, whilst the eyecup has an external diameter of 42mm, both of which are fairly large in comparison to most other full sized binoculars that I have reviewed. This along with the rubber coating helps to make the eye-cups nice and comfortable even when pushed quite firmly against your face. The twist-up (helicoid) mechanism on these Vanguard Endeavor ED binoculars is nice and smooth and works well. There are two fixed intermediate stops in between fully extended and fully retracted which gives eyeglass wearers more flexibility when it comes to adjusting the eye-relief to suit their exact needs. The 16.5mm of eye-relief is also very good and they make it onto my list of long eye relief binoculars. More importantly this should be enough for most people who wear glasses to be able use these optics without having to remove them and still get the full field of view without any vignetting. Non-eyeglass wearers will just use the eyecups in the fully extended position. I really like the central focussing wheel on these Vanguard binoculars, it looks to be made from metal and has a soft rubber track with large indents cut into it running around it to help with grip and has a diameter of 33mm, which places it on the larger end of the scale for a full sized binocular. Because this nicely grooved wheel is fairly large and also protrudes out from on top of the binoculars, it makes adjusting the focus very easy even with thick gloves on. The actual focusing mechanism is geared so that it only takes three quarters of a turn (about 270°) of the wheel to go from infinity to it's minimum focusing distance. This is a very aggressive mechanism and it means that focusing from near to far (or vise versa) is very quick (taking less turning of the wheel), but it does have the very small trade-off of making fine tuning your focus just that bit trickier as a relatively small movement of the wheel moves the focusing plane a relatively far distance. Personally I really like this fast focusing mechanism, I never found it a problem to fine tune the focus and it was not noticeably any more difficult to fine tune than my control binoculars that take a full one and a half turns go from infinity to minimum focusing distance. The diopter adjustment ring is located on the right barrel, between the eyecup and the barrel. It is lockable and unlike the plastic ones you find on many cheaper optics, the diopter ring on these is has a rubber covering with grooves cut into it to help with grip. This ring is used to correctly set up and focus the binoculars to your particular eyesight and only really only needs to be done once when you first use the binoculars, or if you share them with others. This is why I really love the fact that it is lockable and to adjust it you have to pull it upwards before it will move. This prevents it from being accidentally moved. I like the fact that there are a number of markings on the body of the optics and the ring, meaning that if your setting is not neutral, you can use one as a reference point to easily return to, should you want to change it for any reason (like when sharing your binoculars). You will not believe how many manufacturers forget to add such a simple thing and while it may be a very minor point, it is this and the many other attention to the small details that I really like and shows that Vanguard has really thought about the product. At least one of the elements in each of the Vanguard Endeavors lenses has been made from extra-low dispersion glass (ED). ED glass is used in lens elements on high end optics like these because it can reduce the amount of chromatic aberration (color fringing) and improve the sharpness of the image even further when compared to those made from standard glass. This extra-low dispersion glass is able to do this because it gives the designers of the multi-element objective lens a wider range of options to better direct and concentrate the wavelength of light. Generally speaking, the better the aberrations are controlled the cleaner and brighter the image will appear. Because of the costs involved and precision needed to make them, ED glass is only usually found on high end cameras, telescopes, microscopes and binoculars. Vanguard Endeavor ED 10x42 DCF binoculars also have fully multi-coated lenses - this basically means that the lenses have received multiple layers of anti-reflective coatings on all air-to-glass surfaces which increase light transmission to produce a brighter image and therefore better low light performance. Anti-reflective coatings can make a really big difference on the brightness of the image produced. It is not unusual to look through binoculars with smaller objective lenses, but with higher quality anti-reflection coatings and seen them outperform binoculars with much larger objective lenses, but with fewer or no coatings. Beware of these lower quality optics that will often only add multiple anti-reflection coatings to the outer surfaces of the lenses (Multi-Coated) and cheaper still, the optics that only have a single layers of anti-reflection coating added to the outer lenses (Coated). The very cheapest optics have no anti-reflective coatings at all and I highly recommend staying well clear of these. 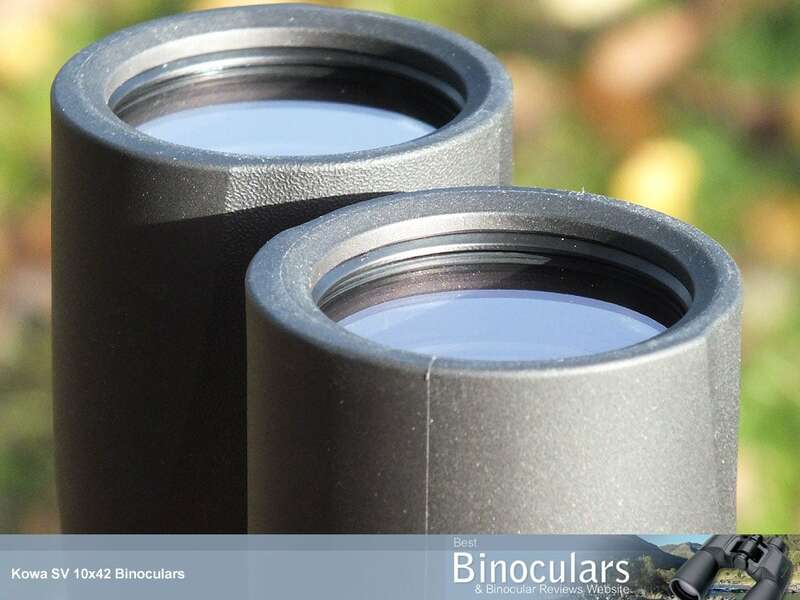 The excellent quality optical components and coatings do not end with the lenses as the roof prisms on these Vanguard 10x42 binoculars are made from BaK-4 glass. This superior optical glass helps to produce clearer images will outperform the BK-7 prisms found on cheaper optics. As well as the quality of the glass used, Vanguard have added their proprietary P2 phase correction coatings onto the prism. These coatings have been added because when light waves are reflected at the opposite faces of a roof prism, "phase shift" occurs which means that you get a small amount of deterioration in sharpness. Phase correction coatings counter this by keeping the light in the correct color phases and therefore produce images that have better contrast, a higher resolution and improved color reproduction. These coatings are only really found on higher end roof prism binoculars. The one downside to the roof prism design is that the first prism in the system has one surface that does not feature total internal reflection, this results in the loss of some light. 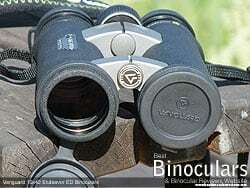 It is therefore very important for a binoculars' optical performance to raise the reflectivity of this surface. To do this, better quality binoculars have single or even multi-layer coatings on the surface of the prism to raise it's reflectivity. The least expensive way of doing this is to use an aluminum mirror coating, which has a fairly high reflectivity of between 87% to 93%. 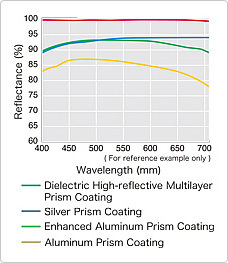 However if a silver mirror coating is used you can get a much higher reflectivity of 95% to 98%, but these coatings cost more and the practice of forming high reflectivity optical coatings with silver also takes substantially more effort than with aluminum, in part because of specific material problems that arise from the aggregated structure of depositing thin metallic films. So because of this you only really find these coatings on very high end products like what I assume Vanguard are referring to as their "V-Max Silver coating" used on these Endeavors. I should also point out that light transmission of the prism can be improved even further by using a dielectric coating rather than a metallic mirror coating. This causes the prism surface to act as a dielectric mirror and a well-designed dielectric coating can provide a reflectivity of more than 99% across the visible light spectrum. But once again these cost more than even silver coatings do and so are only found on relatively few very high end binoculars. Often the trade off for a wide field of view is a longer minimum focussing distance. I consider 6ft or under to be excellent and the closest distance you can focus on an object with these 10x42 Vanguard binoculars is 8.2 feet (2.5m), which is not excellent, but is still pretty decent. So whilst you could never recommend these as dedicated close focus binoculars, if you occasionally like to look at things like butterflies from close range then they will be fine. Their maximum eye-relief of 16.5mm is very good and should be enough for most people who wear glasses. As with all my reviews, I compared the view through these Vanguard Endeavor ED 1042 binoculars with that of my control 10x42 binoculars. These comparisons were carried out on an overcast, but fairly bright day and once again just before and after sunset. This is always a hard parameter to judge and is very subjective and often you can't notice any difference between two good quality binoculars. But I felt that the contrast of the image produced was very good and once you have correctly focussed on an object the image is pin sharp. I would also say that the colors that are produced look and feel nice and natural, unlike the artificial tints that you sometimes find on cheaper binoculars. In my opinion, the depth of field for a binocular with a 10x magnification is about average as they were about the same as that of my control pair. Compared with my benchmark binoculars, I could just notice as small improvement in image brightness, but only in the evening when the light conditions were very poor. This means that I rate them as very good and well above average in this department. Good light gathering ability is important because quite often you will find yourself in situations where the lighting is sub-optimal, especially in thickly wooded or forested areas, early in the morning just before or at sunrise or late afternoon when most birds and other animals are at their most active. 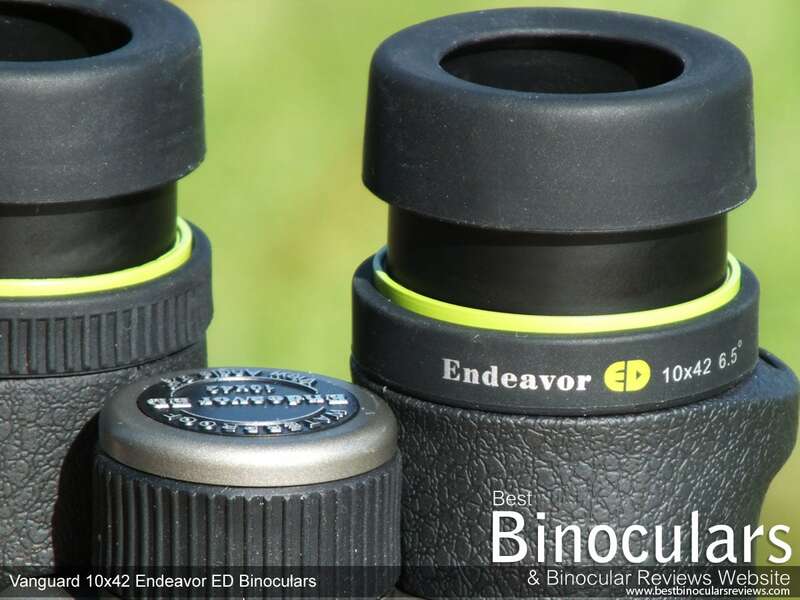 All 10x42 binoculars, including these Endeavor EDs have an Exit Pupil of 4.2 and a Twilight Factor of 20.5, both of which indicate that they will perform pretty well in most low light conditions. But no matter how much light your binoculars gather, it is no good if that light is not passed onto your eyes (transmittance) and this is where it is important to know that not all 10x42 binoculars are created equal as the performance of a pair of optics in poor light depends hugely on the quality of the glass and optical coatings and not just the exit pupil and twilight factor formula. Good coatings on the lenses and the prisms can in some cases double the amount of light that gets through the binocular, when compared to those that have none or poor quality coatings - As we have already discovered, these Vanguard Endeavor binoculars use really good quality coatings and glass that help to transmit more light to your eyes and therefore produce a brighter image than inferior binoculars of the same design and configuration. This is the area where the ED glass used in these optics should make a difference and help to minimise the amount of chromatic aberration (color fringing). To test for signs of color fringing, I focus on light coloured and white objects that contrast greatly with something in the background and look at the edges of the light objects. Again this is a hard parameter for me to judge as it can be hard to distinguish, but if there was any color fringing on these Vanguard's, I could not notice it. So I rate these as excellent in this area. There is some softening of the image right at the edge of the view on these bins, but it is minimal and to be fair, only particularly noticeable if you are actually looking for it. But I would say that there is a little more softening than that of the best. 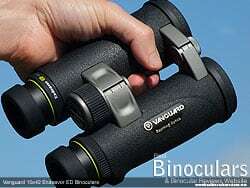 Therefore in this area, I would say that these Vanguard binoculars are about average for bins in this price range. To sum up, I rate the overall view through these 10x42 Vanguard Endeavor EDs as very good to excellent. Below is a table comparing some of the main features and specifications of this Vanguard 10x42 Endeavor ED Binocular with a selection of other full size roof prism binoculars with magnifications of 10x - The Carson 10x42 3D, The Kowa SV 10x42, the Minox 10x42 BV's, the Swarovski 10x42 EL's and the Steiner 10x42 SkyHawk binoculars. 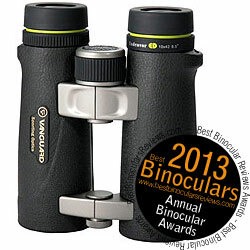 Comparing a mid priced binocular like these Vanguard binoculars with something like the Swarovski 10x42 EL that is far more expensive may seem a little unfair at first, but as long as you keep in mind the price difference, it does throw up a few interesting points and can highlight a few of their relative strengths and weaknesses. What the table above does highlight is the fact that they have a very wide field of view for a 10x porro prism binocular. Also considering their price, the the fact that they come with ED glass and have phase correction coatings on the prisms is impressive. The next strap that comes with the Vanguard Endeavor binoculars looks to be very well made and is of excellent quality. It is nice and wide and very well padded and I also like the fact that the padded section that hangs around your neck is slightly curved to ensure that it hangs more naturally, although it should possibly be a little more curved than it is. The strap however does not have loops between the padded section of the strap and the cords that connect to the optics that you sometimes find and which allow for al little more freedom of movement when moving the binoculars from your chest to your eyes. This is an extremely minor thing, but is something that I do like on a neck strap. What I do really, really like about the neck strap is that you can convert it to be used as the carry bag strap using the clips. This allows you to have a very comfortable and longer carry bag strap if you are not going to be using your binoculars and then to quickly move the strap onto the binoculars when using them. I like it that you can carry the binoculars using the "short" version of the strap which makes for a very secure way of holding onto them (see image on the right). The soft carry case that come with the Vanguard Endeavor EDs is like the neck strap in that it looks to be made very well and out of high quality materials. It is however not the most padded case that I have ever seen, so may not protect the binoculars completely from heavy impacts, but will be enough for minor knocks. You gain access to the bag via a large zipped opening. The binoculars fit nice and snugly into the bag, which helps with protection, but a slightly annoying aspect is that it is hard to close the zip if you have the eyecups fully extended with the eye covers on. There are no extra internal pockets inside the bag, which is also a bit of a shame as they often make a great place for storing a few small personal items and your lens cleaning cloth. Like the binoculars, the carry case comes with its own short strap, which is great for carrying it in your hand, but can then be unbuckled and you can then connect the end of the neck strap to it which is a really nice feature as most carry cases only come with a very basic strap. With this one you get to use the fully padded binocular. The eye-piece cover (rain guard) is made from what looks like a soft rubber or plastic, it fits very well over the eye-pieces and should not accidentally fall off. I like the flexible bridge between the two cups that allow for the different distances between the two eyepieces depending on your inter-pupillary adjustment. This is sometimes overlooked, meaning that the rain guard wont fit, unless you store your binoculars fully open, which can be a real pain as you have to adjust them every time you use and replace your binoculars. The soft rubber objective lens caps fit well over the ends of the barrels and like the rain guard should not accidentally fall off. I like the loop that keeps them tethered to the barrels of the binocular, allowing them to hang down out of the way when you are looking through the optics, preventing you from loosing or misplacing them them. If however you don't like your lens covers attached and hanging down when glassing, you also have the freedom to simply remove them completely and put them away in your bag. I also really like the fact that the objective lenses are set quite deeply within the body (about 6mm) - which will help protect them when the lens caps are removed. Inside the box you will also find a good quality lens cleaning cloth and a fairly generic user manual that includes details like adjusting the eyecups, how to properly attach the neck strap, the inter-pupillary adjustment, how to properly focus your binoculars, lens care and cleaning etc. In the box is also the warranty card that gives you details of the Vanguard Premium Lifetime Warranty for this binocular. These binoculars can be attached to a tripod using a tripod adapter (not included) that uses the standard ¼-inch threading. To attach the adapter to the binocular you just unscrew the small cap on the front of the central pivoting point on the binoculars. Strong Points: The standout feature on these Vanguard Endeavor ED 10x42 binoculars is undoubtably their really wide field of view, especially when compared to most other 10x42 binoculars. The use of excellent quality optical components and coatings help to produce a very good quality as well as bright image that is as good as and even better than many far more expensive than these. They are well balanced and I love the feel of the comfortable and 'grippy' rubber coating in the hands. The small touches and attention to small details like the lockable diopter ring, comfortable thumb indents, very smooth and well placed focusing wheel and the excellent quality and well padded neck strap that can also be used as the carry case strap also help to reinforce the feeling that you are holding a quality pair of optics in your hands. Weak points? Like many high end binoculars, these don't have any major failings or serious weak points. Some may wish for a closer minimum focusing distance, but the trade off of this would undoubtably mean a slightly narrower field of view. Besides if you are looking to really observe objects from close range, you probably don't need a magnification as powerful as 10x anyway. Ideal Uses: It is not that often that I highly recommend a 10x42 binocular for birding, but the fact that their field of view is so much wider than the majority of other 10x42's and because they produce such a relatively bright image, it makes these an ideal choice if you do a lot of bird watching in fairly open areas, over longer distances like around lakes or by the sea or if you just want to get just that bit closer and get just that bit more detail than what you would with an 8x or 7x binocular. For more please take a look at my article on 10x42 Binoculars for Bird Watching. 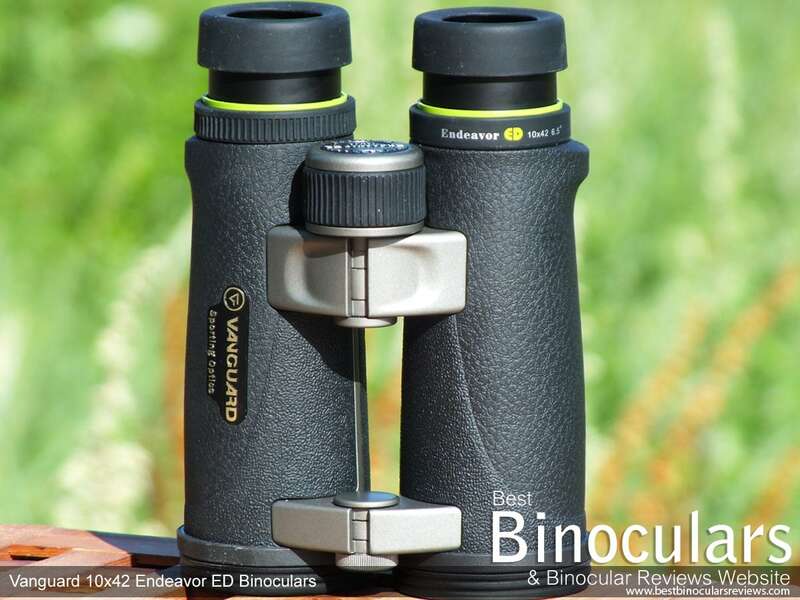 Like most 10x42 binoculars, these Vanguard Endeavor EDs also make ideal general wildlife observation optics, hunting binoculars and are easily light and adaptable enough to be considered great general use optics. They also more than hold their own as a binocular to take camping as well as on any safari, however depending on your circumstances and how light you travel, some may prefer a slightly more compact binocular for these uses. 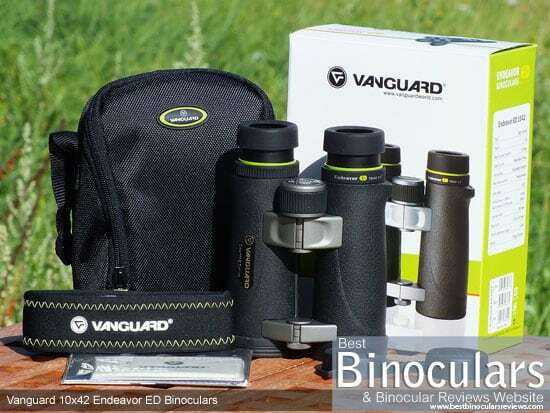 I would like to thank Vanguard for sending this binocular to me to review I would also like to point out that all the reviews on this site, including this one are my opinion and are not influenced in any way by manufacturers, distributors or suppliers.